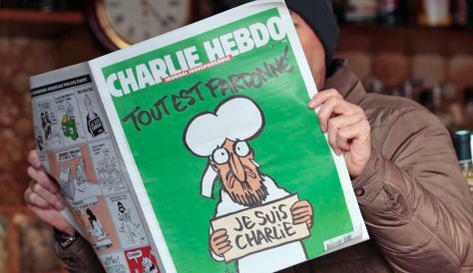 A depiction of the Prophet Mohammed crying and holding a “Je suis Charlie” sign under the words, “Tout Est Pardonné” (“All is forgiven.”) on the new cover of the French satire magazine Charlie Hebdo is ironically, probably a correct reflection of the Prophet’s mindset, rather than the angry sensationalism expressed by many Muslims. Anyone that has studied the early history of Islam would learn how the Prophet initially struggled over many years to spread Islam in his native city of Mecca. He was even mocked and belittled by some of his own relatives. In the year 619, during his visit to Taif, a city 70 miles southeast of Mecca, he also failed to win over hearts and minds, and instead the residents of Taif pelted him with rocks. The Prophet’s response was not vengeance, but quiet prayers and humility, even later in life when he conquered both Taif and Mecca. As such, the story of Taif is perhaps a lesson for Muslims today as they struggle to handle Charlie Hebdo and its defiance after radical Islamists stormed the magazine’s headquarters in Paris last week killing twelve of its journalists. Tarek Osman rightly pointed out how most large Islamic institutions have condemned the massacre at Charlie Hebdo, but none have embraced the “Je Suis Charlie” campaign. In fact, the new edition of Charlie Hebdo has triggered angry reactions across the Middle East. This inability to support Charlie Hebdo, or grasp its defiance does not just stem from Islam’s theological position on blasphemy, but reflects how Muslims perceive the evolution of their own history. Muslims were taught how Islam turned a page following the Prophet’s trip to Taif, and rapidly became a victorious and dominant empire where even non-believers respected Muslims. This alleged respect is what some Muslims are demanding now from Charlie Hebdo and the Western world in general. This concept of respect, however, is fundamentally flawed. First, hurling insults against Islam is not something new, it started with the rise of Islam, and as early as in the account of Taif, and continued throughout medieval times, albeit quietly. The larger problem is the inability of Muslims to swallow the fact that in a modern global world, criticism and mocking behavior cannot really be sequestered. In fact, technology and interconnectedness can make it as glaring and direct as in the old days in Mecca and Taif. “Show me just what Mohammed brought that was new and there you will find things only evil and inhuman, such as his command to spread by the sword the faith he preached.” This quote was written in 1391 as an expression of the views of the Byzantine emperor Manuel II Palaiologos. Today, the only difference is technology that enables mockery and insults to spread beyond the confinement of closed doors or national borders. As recently as 2006, Pope Benedict XVI dared to recite this old quote. Third, while Muslims demand respect, some of them clearly pervert this concept of respect when they misguidedly equate offensive cartoons with crimes such as butchery, crucifixion, slavery, and other revolting practices committed on daily basis by radical groups like ISIS in Syria and Iraq. The “both are bad” cliché is dangerous because it absolves Muslims from any responsibility to fight the growing radicalism growing from within their faith by equating it with satire. What they can’t see is that satire, even if vile and offensive, is not as harmful to the prophet as the crimes that are committed daily under his name. As Nadim Koteich has written, “The truth is that what the killers did in Paris has only reinforced the images drawn by the artists of Charlie Hebdo.” Furthermore, our alleged sensitivities to satire has acted as an indirect PR campaign that has helped Charlie Hebdo gain a worldwide audience and a distribution of paper copies to millions around the globe. Fourth, Muslims seems shocked by the alleged disrespect of Charlie Hebdo fail to see how their threats will only provoke defiance. The Turkish PM claims that Turkey will not allow Mohammed to be insulted are nothing more than a political gesture to his faithful supporters. In reality, no one can stop satire. On Twitter, British journalist Piers Morgan tweeted, “The brilliant new cover of Charlie Hebdo. I suggest the entire world re-tweets this.” Subsequently, his tweet was indeed re-tweeted twenty-four thousand times. While Turkey can certainly ban the publication of such cartoons in Turkey, they cannot prevent the rest of the world from perusing such content. Perhaps the Prophet is now watching us from a distance. Off course, we can only imagine what he is thinking, but it is doubtful that he is proud of his followers’ inability to restrain their anger or learn from his graceful handling of past ordeals in Mecca and Taif. In fact, the “Tout est pardonné” theme fits well with what Muslim scholars taught us about the Prophet. It was his forgiving nature that earned him respect and admiration. The Prophet did not force respect; he earned it. Anger, blame, and victimhood are certainly not the right tools. It is time for Muslims to put the proper tools in place and use them to earn respect. This entry was posted in Best Read, Islam, Middle East, Politics, Turkey and tagged “Tout est pardonné, Charlie Hebdo, France, Islam, Muslims, Prophet Mohammed, Radicalsim, Terrorism. Bookmark the permalink. Well articulated, I would love to see more reflective articles like this. Thank you, we need to hear these views more prominently I am glad i cam across your blog. Many thanks. Truly appreciate your feedback. Presumably, the Muslims who have been rioting over the latest Charlie Hebdo cover have not actually seen it, given that no one in their society would dare show it around. They wouldn’t know that it is actually forgiving and, in a sense, respectful. I wonder what they think, or have been told, it depicts.